Also....i asked when the last time btc was longable. Answer: 7th december!!! As much as i love ig...im ceasing trading. Its not just btc....all cryptos are unlongable and this is just ridiculous now. Closed all my bets which have almost wiped out profits made in december...but i just cant trade under these restrictions. Need my sanity back. Will keeping watching the community threads. When things are better i will return to trading. Looking forward to ripple and some other cryptos becoming available on IG. The way this market has developed right now indicates to me that it is entirely unsuitable for daytrade or short term methods. The underlying liquidity is too low. IG simply cannot find enough BitCoin to buy to match your position, hence the frequent unlongable status. IG also cannot increase its own net long exposure when you close a hedging short position, hence you must close a long before you can close a short. The spread:price ratio is too high, reflecting the low liquidity. The volatility is huge and the margin requirements are large, again reflecting the state of the underlying market. I reckon this train has already left the station; I'm not chasing after it. The 'easiest' money to be made now is likely to be in the mining of new coins, not in trading existing ones. And that is getting exponentially more difficult, being kept viable only by the rising price. Coins are more difficult to come by, but more valuable when you get them. For me, cryptos are entirely unsuitable at the moment. Two interesting bits of news that went through last week, both from Bloomberg I think, was that only around 1000 people own 40% of bitcoins, and that the exponentially increasing rate of mining will consume as much electricity as the whole world uses now, by 2021. Liquidity must be a major factor in this market. IC Markets the latest in long line of brokers upping margins on crypto. If that second speculative fact becomes true then that's frightening and even more of an argument for the PoS overtaking this outdated and expensive PoW model. 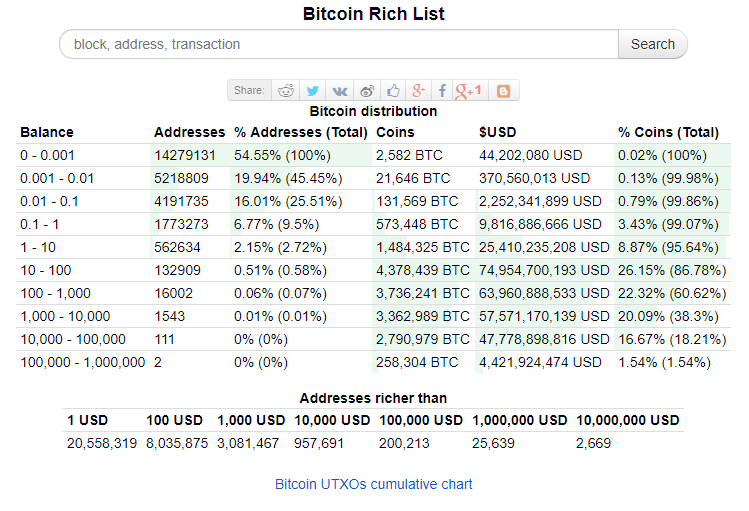 In regards to the first point you can see BTC distribution (by wallet not individual) here. It's quite hard to get a truly accurate answer to this due to the nature of the underlying tech and most people splitting BTC over multiple wallets, but based on Bloomberg's historically accurate analysis I wouldn't be surprised if they were fairly close to the truth. Oh to be in the 0.01%. I wonder how much coin the 0.01% could offload without crashing the price. They could be hostages to an unrealisable fortune. (Unless Bitcoin does replace currency, but I don't think the CB's will allow that - unless they can control it). The whole thing smells of a mania right now. Just ripe for some predatory 1920's-style market manipulation. A few - a very very few - will make a fortune (have made a fortune), but I wonder how many institutional investors, packed full of smart people who 'should've known better' are going to get burned. But anyway. The current Bitcoin phenomena isn't really about Bitcoin. It's an interesting thing to watch play out. It could be a game changer. Just for reference, a link to the 1000 owners article and a link to a re-write of the power consumption article by Zerohedge (can't find the one I read). I will not be using IG again. Either let me take a position or don’t. But at least have the decency to inform me before I add cash to my account which is then stuck for 3 days!!!! Do not use IG to trade crypto!!! As it was me who started this post, let me help put some perspective in this situation. First of all, I totally agree that it is very poor level of service from IG. They should clearly not be offering Cryptocurrencies as a product offering if their clients cannot go long or short when they want to. Many people have put their complaints and feelings towards IG and James has responded so I won't repeat his post. James has answered as honestly and as detailed as possible. This was an issue for me during the summer months. So what did I do. I looked for alternatives. There are other platforms that you can go to. Yes the charges may be higher but if you making massive amounts of profits and trade when you want to then I would rather pay higher charges! I will not repeat which brokers I have suggested but if you research and spend time on Google it really is not that difficult to find other brokers that offer more choice on Crypto's as well. However I did not just stop there. I then looked for different ways to gain exposure and found the XBT Tracker One funds in EUR and SEK for both Bitcoin and Ether. I invested in both of them in the EUR and SEK currencies. I got triple digit returns in three weeks. Both positions are still running and even after recent drop both are still showing triple digit returns in around a month now. Taking the time and conducting some research on the Internet, looking at alternative options, weighing up costs (higher) against more choice and ability to trade both long and short when you want needs to be considered. It does not take long. I am sure IG would offer a better service if they could. They are unable to at this point and therefore everyone has to make their own decision and choose the best option for them. I've gone to city index for a try, anyone else used them? I agree. IG should not offer Bitcoin unless it is prepared to allow buying and selling. The FCA should be more strict and force through good practice. I have gone to City Index also. No issues with bitcoin liquidity yet. The minimum stop distance isn't as large as IGs which I have noticed has recently moved to 500 pips. The bitcoin spread is typically 90 pips. Also daily funding at CI isn't that expensive in the greater scheme of things. The platform however leaves a lot to be desired; the mobile platform is laggy. Frequent re-quotes when trying to open a position. They don't price bitcoin over the weekend. But so far they are the best alternative I have found. I also have accounts with Plus500 and intertrader but the bitcoin spread at Inter is too wide for my liking. The platform also has the aesthetic of one made a decade ago. Plus500 has the feel of a provider who will disappear overnight with your funds so I keep them at arms length. Can't fault a 250 listed firm like IG for trying to limit their liability. The crypto market has been 1-sided of late and this has affected a number of providers who are trying to reduce or in some cases completely remove altogether their crypto offerings. I think where the FCA are concerned, IG are taking prudent steps to protect their operating profitability which would in turn further protect their client holdings. Finance magnates wrote about the issue recently, link below. I have found them to be a credible source of info; a little while ago they reported very accurately on a story that I had very intricate inside knowledge of and very few people would have. What platform is allowing long on cryptocurrency at present? Some are trying Intercity but have not reported back, the truth is all brokers are tightening their exposure, increasing margin and spreads while limiting their exposure to long positions but looking at the charts I would be very wary of going long right now. See the last post in the Bitcoin thread. Ig allowing long on all cryptos just now. So IG revised their long parking rates and for shorts even give u free parking LOL. will the unlongable still occur? In addition, what is the trend now? short or long? it pretty much crashed for today..
Why don't you just buy more btc as a hedge against client positions? hi - unfortunately we already hold tens of millions of pounds worth of bitcoin and other crypto assets. We must have a finite risk profile to this asset class (in the same way as we have for all asset classes) so unfortunately we are unable to purchase more as a hedge. We are looking at other options at present such as the CBOE and CME futures and when I have more info I'll communicate that to the wider community. I tried buying after the dip, and the platform wouldn't let me. So I presume that means that although it dropped nearly 50%, IG traders were not closing their long positions (otherwise I would have been allowed to long, right?). This could be quite bullish for BTC. So it got me thinking - I think it would help all IG traders if you would give us access to this type of info - what the IG community as a whole is doing. Do you provide that service? Hi - we have client sentiment here, however this only shows a snapshot of net clients, not their individual positions (e.g. if we had 11 clients and one client was long $10 / point and the other 10 were short $1 / point it would be 50/50, even though there was an overwhelmingly short sentiment). Great, thanks. Perhaps you could consider doing the same sort of thing, but with number of clients long Vs short, rather than net pound value. So in the example you gave, it would be 1:10. I think that would help us all. There's no way of knowing when you can buy. In ether when buy sentiment was 95% it was unlongable, now 90% long but still unlongable. Its like you have to watch it all day. Hey - I understand the frustration with this, I really do, however we are looking to rectify this. We didn't want to have a short term fix of just flashing a little dot or a pop up notification as this would be a short term solution. We already have tens of millions of pounds worth of crypto assets, and whenever we become 'longable' this generally doesn't last very long. The reason for this is the leverage aspect you are trading with with IG. Let me try and go into more detail. To open one contract on the CFD account (which accounts for 100 bitcoin) would create a notional value of $1,450,000 assuming the price of bitcoin was at $14,500. When we are 'unlongable' this means we are already at the max of our total exposure for that asset, so if we've recently come off it then we will not have much leg room before we need to hedge again (which we can't do because we are already at our max exposure due to holding tens of millions of pounds worth of bitcoin), and thus become 'unlongable' once again. Now it's unlike that there will be a single order for 1 contract as this would require 30% margin, or $435,000, however we do have 150,000 clients so it's easy that the minimum bet sizes quickly make up whatever 'leg room' we have from an exposure point of view. You can read more about that here: simply put (accurate at time of originally posting) "When it comes to unlongable / unborrowable: The introduction by the CBOE and CME for bitcoin futures is significant, not only as a keystone in the underlying cryptocurrencies history, but also the potential it provides in perfecting IG's offering. The head of our cryptocurrency deak, our risk team, and those involved with setting up new futures are all seriously looking into the opportunity which this will provide. If this is successfully implemented we hope this will provide advantages to hedging your trades, and overcome the restrictions we have on the unlongable / unborrowable. Once again I can't provide a concrete time frame on this because the CBOE haven't even traded for a week, and the CME haven't even listed yet."